How are brands and agencies adapting to the gathering economic storm clouds, asks Chris Arnold, founder, Creative Orchestra. Yet another retail giant has toppled, Toys R Us has filed for bankruptcy in the US and Canada last month. Established in 1948, it has 1,600 stores and 64,000 employees. Its failure is not due just to online competition, but also a failure to keep up, innovate and understand its changing consumer. This has been evident for years, making it a perfect example of the "Retail Epocalypse" (as christened by the US financial sector), which is happening in malls and high streets across the globe. US retail has been in trouble for a while, with well-established names such as JC Penney, Macy’s and Staples closing stores en masse. Credit Suisse predicts that by the end of 2018, up to 25% of US shopping malls will have closed. Ironically, despite online competition, many bricks-and-mortar retailers, such as Laura Ashley, are more than compensating for their high-street decline with online sales. But what happens in retail affects suppliers from fashion to food and, in turn, agencies. Toys R Us is just the tip of an iceberg; over the past 15 years, 52% of companies have vanished off the Fortune 500 list of companies, and the life expectancy of a company, originally 75 years, is now said to be just 15. No matter how big you are, you could be the next Woolworths, Blockbuster, Kodak, PanAm, Phones4U – no company can be complacent. This isn’t just down to online and technology, there is a global change in consumer preferences, meaning they are shunning big multinational brands for local, smaller and more ethical companies. You can blame the millennials and Gen Z; they are the main consumers behind this. But, ironically, this digital native generation is proving hard to market to. Already, brands such as Procter & Gamble and Unilever have pulled millions out of digital marketing. Between January and May of this year, compared with the same period in 2016, P&G’s spend was down 41%, while that of Unilever was down 59%, according to MediaRadar. RB’s 15 years of growth has now gone into decline. It is one of the world’s biggest health, hygiene and home FMCG companies, and owns the Dettol, Strepsils, Veet, Durex, Cillit Bang, Vanish, Harpic, Lemsip and Nurofen brands among many others. But success is no longer assured in today’s consumer economy, as David is thriving at the expense of the Goliath brands. So Sir Martin Sorrell has every reason to be a worried man. After all, his main clients are the traditional, large, old-style brands. Far from delivering an increase in dividends, WPP shares are down. Worse still, 2018 could see ad budgets and media spend crash through the floor. It’s not looking good for big agency groups, especially media agencies. Agencies will have to do some serious rethinking about how they spend clients’ budgets and make margin. This is especially pertinent in light of new contracts preventing them talking hidden commissions, after the scandals in the US. 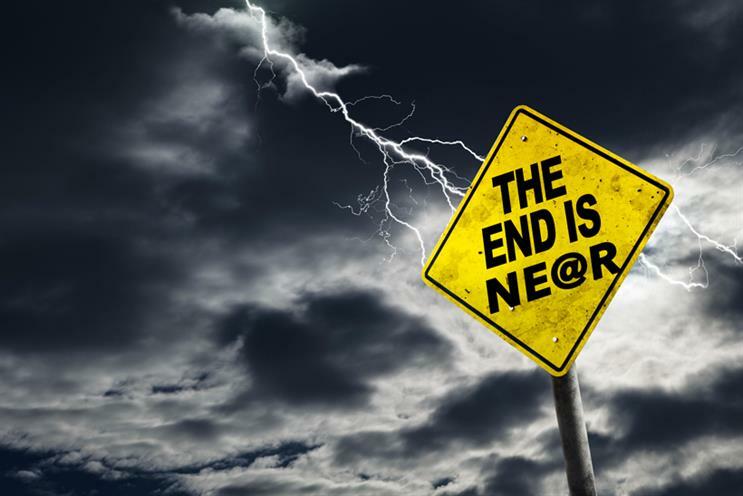 However, as brands brace themselves for the Epocalypse, there is a golden opportunity emerging for agencies. The world is constantly moving, and if your business isn’t, you’ll get left behind. This was one of Toys R Us’ problems – it had an old model and failed to keep up. It had big, expensive stores (large sheds), with lots of stock and massive overheads to maintain. Ikea may want to consider that dilemma. Creativity, innovation and the ability to think differently are the skills brands now value. And that’s what sits at the very core of good agencies. It’s no coincidence that the bigger the brand, the bigger the adspend, but marketers are now aware they are not always getting good media advice and want more for less. A key aspect of what has been termed Adconomics is making smarter use of budgets, which is good news for the creative industries, as the only way to maintain, or even gain, effectiveness when you cut media spend, is by improving the quality of the content. All the algorithms or big data in the world can’t compete with a great creative idea. Given that 75% of effectiveness (as defined by Google) is down to what you put in the media space, it seems crazy that most brands spend 85% of the budget on the media itself. With good creative, you could achieve the same result with half the media budget. Trivago, please take note. Changing economics means changing ideas and changing models, which, in turn, means casualties, but also new opportunities.